At this point I had never even heard of a Leapster, but I was intrigued since it seemed like such a popular choice for many, almost like a given. Upon further consideration, it looked like a great option for our road trip as well. So, I bought my daughter a leapster and about 8 games. I gift wrapped every item along with some movies I purchased for her and let her unwrap a new gift every so often. It worked well, and I hardly heard a peep from my then 2 year old the whole drive down. She was so very content playing her new games. Having purchased about a dozen and a half more games since then, I have discovered that some games are better than others. There are some games, my daughter hardly touches, and others that she will overplay. Without question, her number one favorite all time game is Mr. Pencil Saves Doodleburg. As a parent, I highly recommend this game as well. To my surprise, my daughter learned to write her numbers and letters, learned to draw shapes, and generally just became fairly comfortable using a pencil because of this game. #1. Mr. Pencil Saves Doodleburg – keeps their attention span so they can learn while playing. #2. Don’t bother with worksheets. I tried it, didn’t work out so well. At this age, worksheets are viewed like the name implies – work. You might be able to sneak in some tracing if the worksheet has limited tracing to it, and is predominately a colouring page or some other fun activity. But attempting to get my preschooler to practice writing a line of A’s, I quickly learned was not a good idea. She did not have the patience for that. #3. Teach them to write their name. Focusing on the letters that make up their name, keeps it small and manageable. It also allows them to see the benefit of learning to write those letters as opposed to an A-Z approach. And there are many opportunities for them to practice writing those letters. Every time my daughter draws a picture or does a colouring page, I ask her if she could also write her name on the paper “so I remember who it’s from“. She’s more than happy to oblige. All this repetition helps her improve her printing skills. At the beginning she would use a lot of capital letters, over time she gradually replaced uppercase letters with the correct lowercase ones. And on occasion, I will gently reshow my daughter how to write a letter, so she will continue to improve her printing skills. #4. Get your child to make “Thank You” cards for people. This works great as most kids love drawing pictures and doing crafts. My daughter gets to pick who she wants to give a card for, and she is always more than willing to get started. It’s as simple as folding a sheet of paper in half or in quarters and showing them where to draw their picture. After the cover is complete, I show my daughter how to write a simple message in the card, like “Thank You” along with her name, or “I love you” and her name, etc. I will show her letter by letter on a separate piece of paper, and get her to repeat each letter on her card. It’s a win win for both of us. She gets the enjoyment of making it and giving it to the recipient and I enjoy all the printing practice that comes with it. Side note: You can eventually teach every letter from A-Z, just include new letters as part of the message. And if your own handwriting is not the greatest, and not what you want your child to learn from, then you could make use of an online custom worksheet maker. There are many free ones out there, here is a simple one I just found. http://www.handwritingworksheets.com/print-k/make-pk-all.htm You can type the words you want to show your child (i.e. “Thank You”), click on “Make Worksheet” and print it out. Then you can still show your child how to write the letters of the message, without having them learn your bad habits. You show them with the worksheet, they try to imitate you on the card. #5. Have an art area set up so your child can draw or colour whenever their creativity compels them. A table with some basic art supplies readily available will provide many opportunities for your child to spend time creating their works of art. A chalkboard would also be a great addition. or a house with a square, triangle for a roof, square window, rectangle door, circle door knob, etc. or teach them to draw a basic flower, or a rainbow. Teaching your child to see the basic shapes that make up an object is not stifling their creativity but rather giving them the skills to further enhance it. And you don’t have to be an artist yourself to be able to teach your child. There are many short youtube video’s and other online resources available. Just do a simple google search “How to draw a …” and you’ll find a lot of options. For example, I googled “How to draw a castle”, and found a minute long youtube video. My daughter and I watched it together, and then she was eager to draw one of her own. It’s simply a square, some rectangles, triangles, and a door. I would love to hear from you as well. What have you personally found effective in teaching a young child to write or draw? 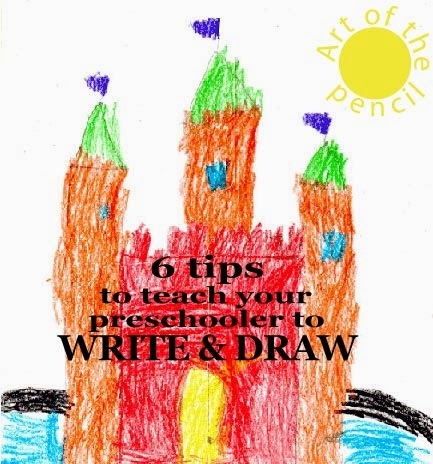 These are great ideas to get a preschooler writing! My 3 and 4 year olds love drawing. It’s been wonderful watching more shapes showing up in their drawings, but I never thought about teaching them to draw using writing. Thank you for the ideas! It’s also fun to change the writing utensils – crayons, pens, pencils, markers. Just changes things up a bit to add a little novelty factor!